Why charm pack + 1? Easy answer – I needed 43 pieces of 5″ squares to complete the 4 pillow cases. As a charm pack has “only” 42 pieces I had to get one more square. I found a matching solid fabric on my stash. Bet that you cannot find the “extra” charm square! I have quilted the pillow cases with the walking foot in straight lines next to the seams. All pillow covers have a zipper closure on the back. Photos of all pillow cases from the front and back before I send them together. Sorry about the colors, I took the photos on a late afternoon. Linking with Sew Cute Tuesday at Blossom Heart Quilts. 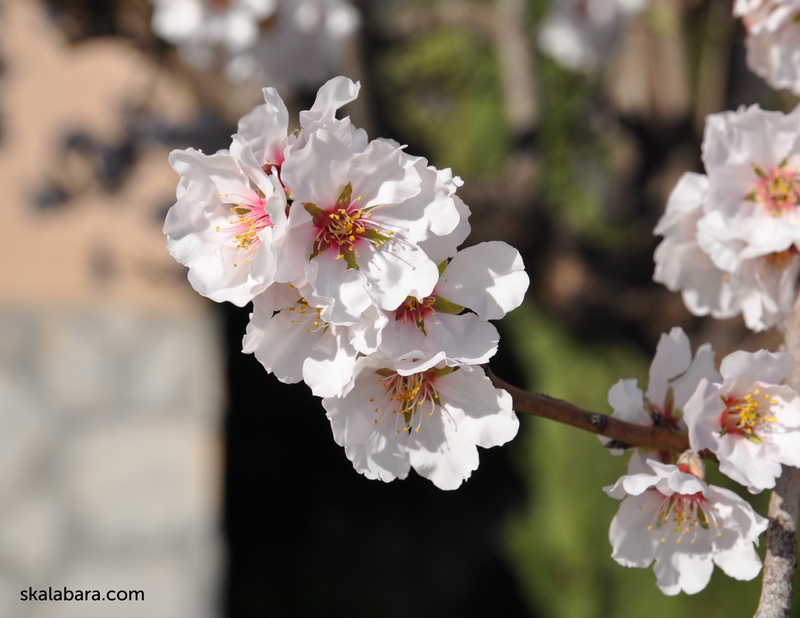 The almond trees have started to show their pretty white flowers. 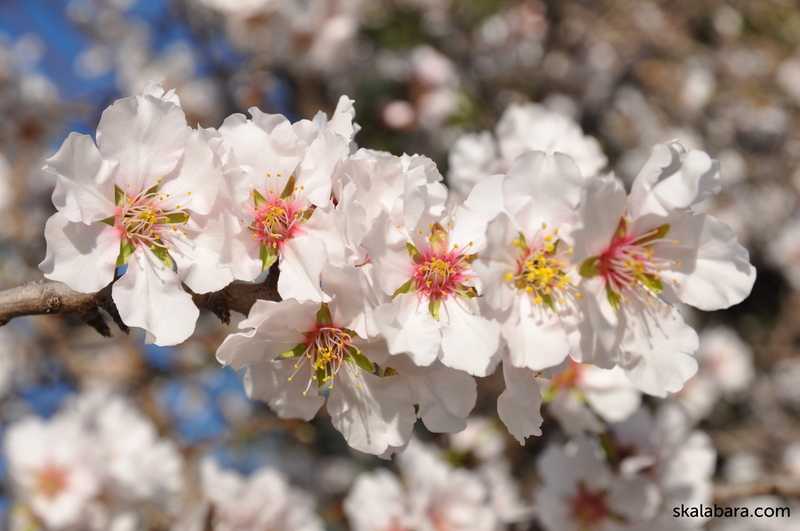 This means that spring is not far away. We can still have some cold nights in February, but the sun rays are getting stronger even in the morning hours. 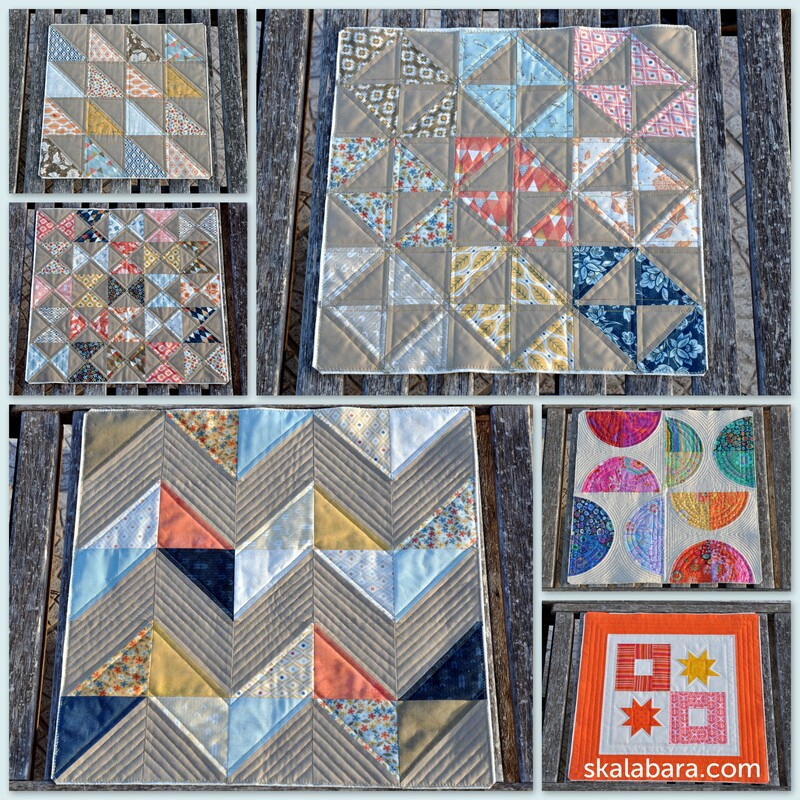 So – I have finished my very first quilt in 2014 and it is called “Picnic with Bella”! This one is staying at home and is for my hubby Helmut for his everyday siesta on the sofa. I am planning to make a few matching pillow covers with the fabric rests. 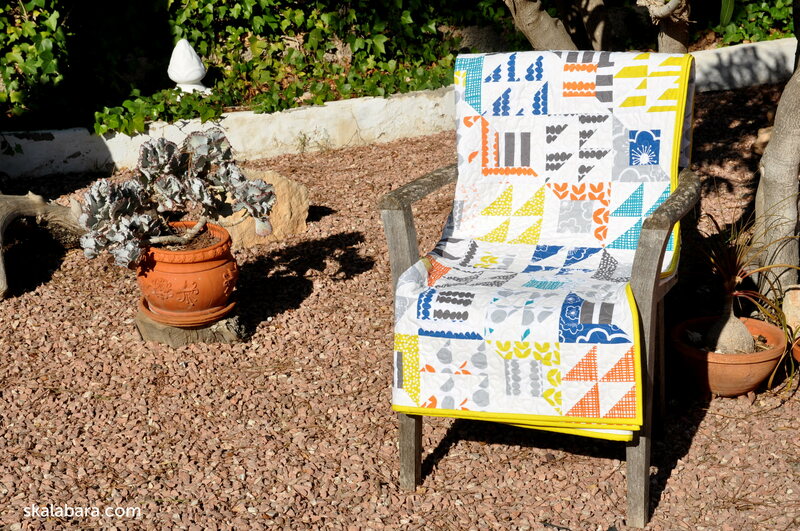 The fabric I have used is from the “Bella” collection by Lotta Jansdotter for Windham Fabrics. It came out at least a year ago, but I never had time to make a quilt. 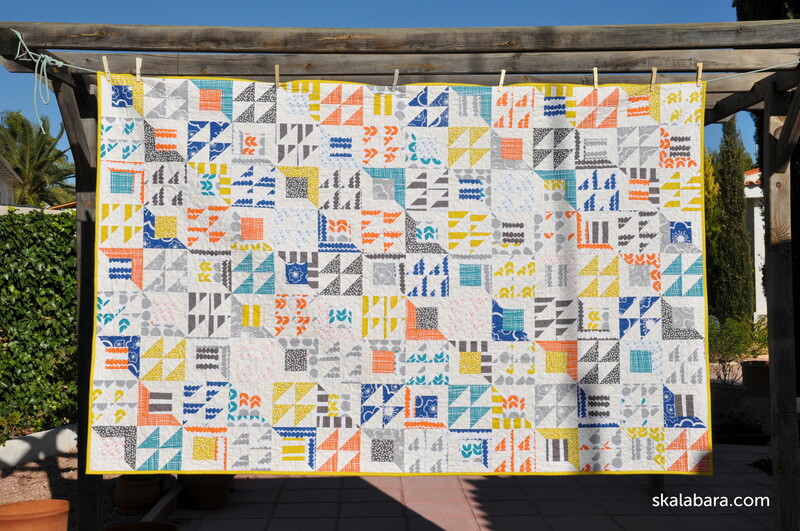 I have made another quilt with an earlier collection by Lotta Jansdotter : Abstract Dreams. 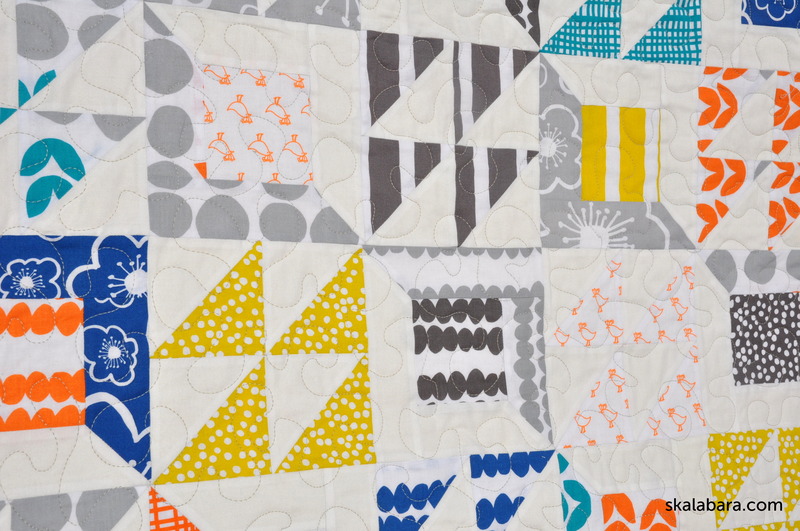 I like her fabric designs and her color choice – modern, bright and fresh. 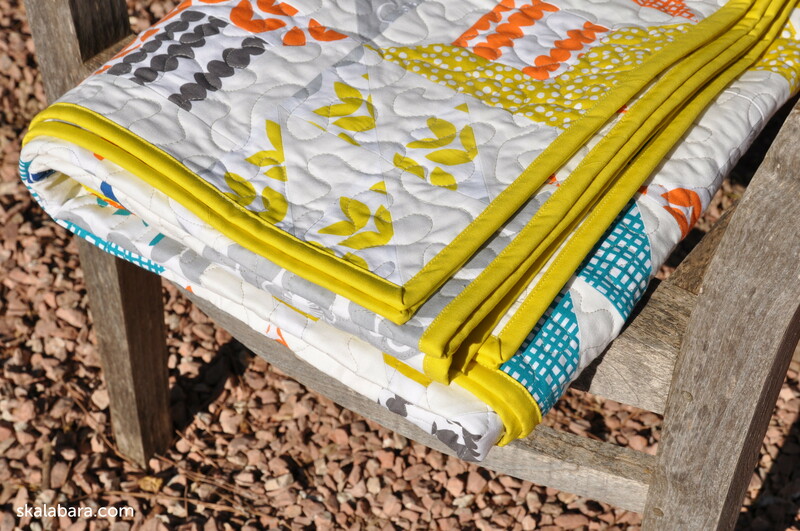 There is a new collection arriving soon “Mormor” – you check it here at Hawthorne Threads. A few weeks ago I have received a parcel from the UK from Cottonpatch with a new (for me) wadding type : Quilters Dream Cotton in Select. This is a mid loft thickness and it was wonderful to quilt. It is not too thick, but very soft and smooth. I think this will be my favorite wadding (or batting?) for my future quilts. Quilt size : 54″ x 84″ / 137 x 213 cm – Finished block size : 6″ x 6″, one block with 4 half-square triangle units and the other block with log cabin units with mitered corners. Free-motion quilted with meanders using Gütermann Sulky machine quilting thread in light grey, #1328. 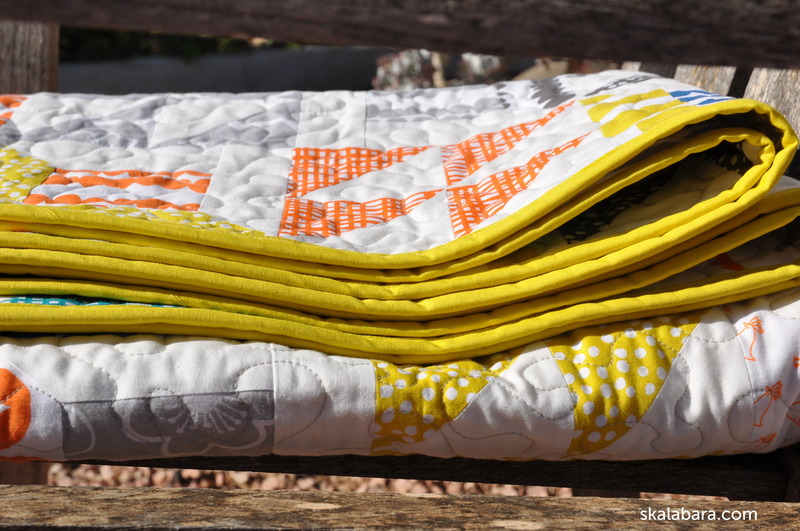 I was so happy to find the fabric for the binding in my local shop Kate’s Craft and Quilting – a yellowish-green from Moda Fabrics that matches exactly with the Bella colors. 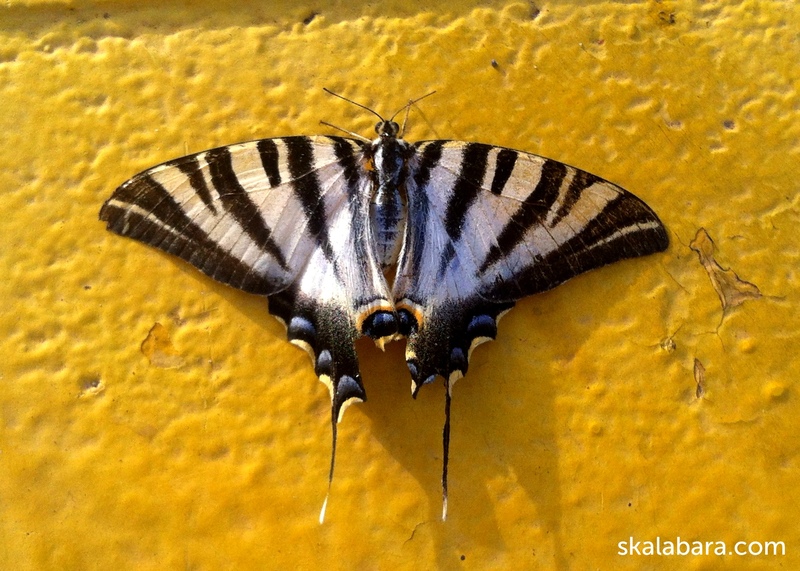 There was no spectacular sunrise this morning to take photos, but instead I found a butterfly on the street. He looked like that he is having a rest. But he wasn’t – what I found was just a colorful dead body of a butterfly. As I am going to Prague this Saturday I was finishing my last pieces that I want to take with me. 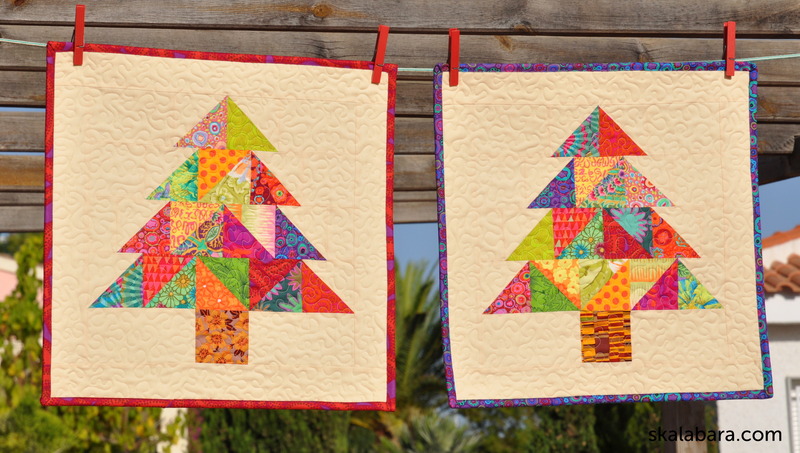 I made more Christmas Tree Blocks – original design by Christen from Love By Hand. 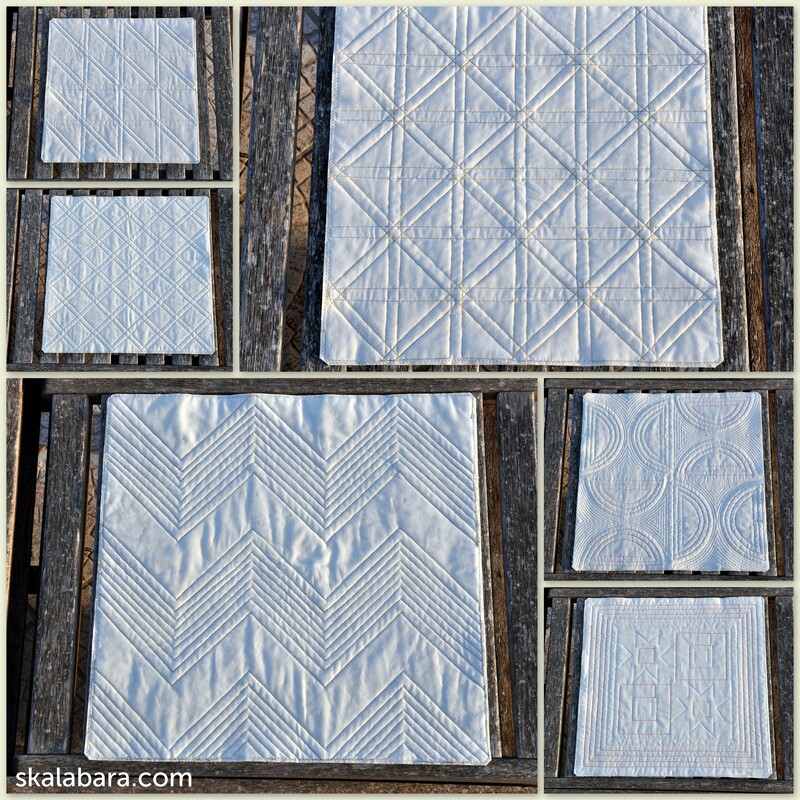 Each block is on its own and makes a nice table decoration or a wall hanging. 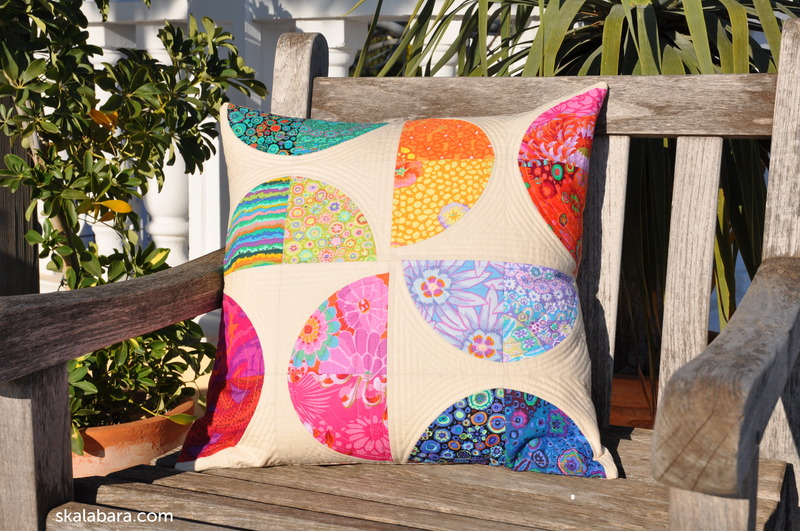 I have used (as before) Kaffe Fassett fabric designs. 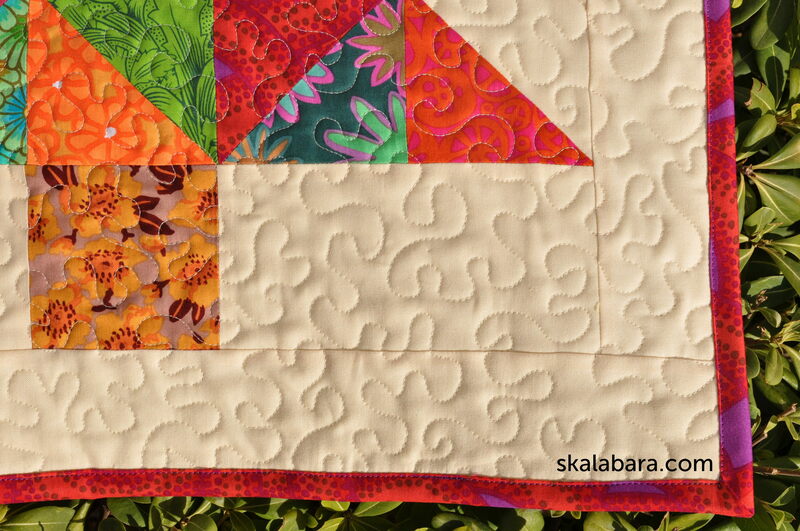 Once I had made the quilt sandwich I realized that I do not have any of my “neutral” thicker quilting thread. 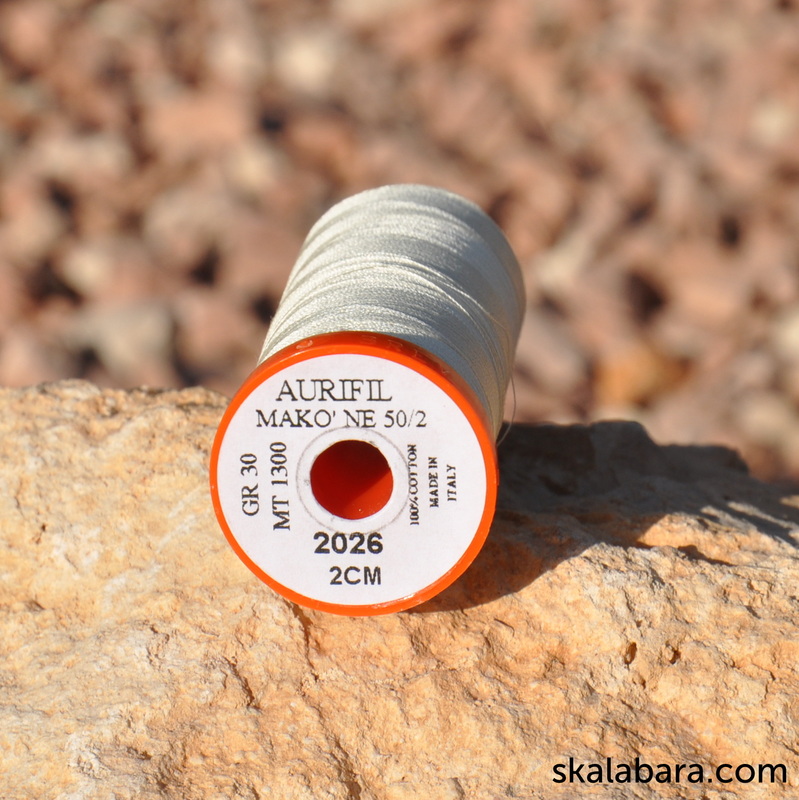 But I had the exact hue in Aurifil Mako 50/2 as I have pieced the blocks with this thread. I just wasn’t sure if I can take it also for quilting. 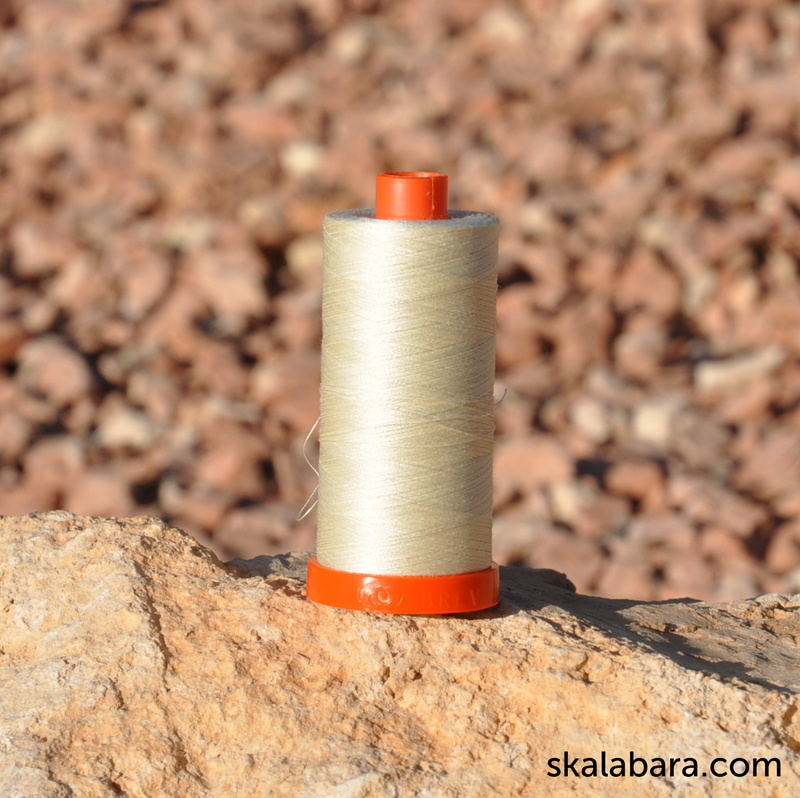 After some research on the web ( a nicer expression for google ) about threads I decided to stick with this lighter weight thread also for free-motion quilting. According to the motto : learning by doing. Over the years I found out that there are no strict rules in quilting. Each quilter can find its own way, own technique that they prefer, threads that they love. I have also done some experimenting with threads and I always go back to Aurifil Mako 50/2 for piecing and Sulky from Gutermann for quilting. 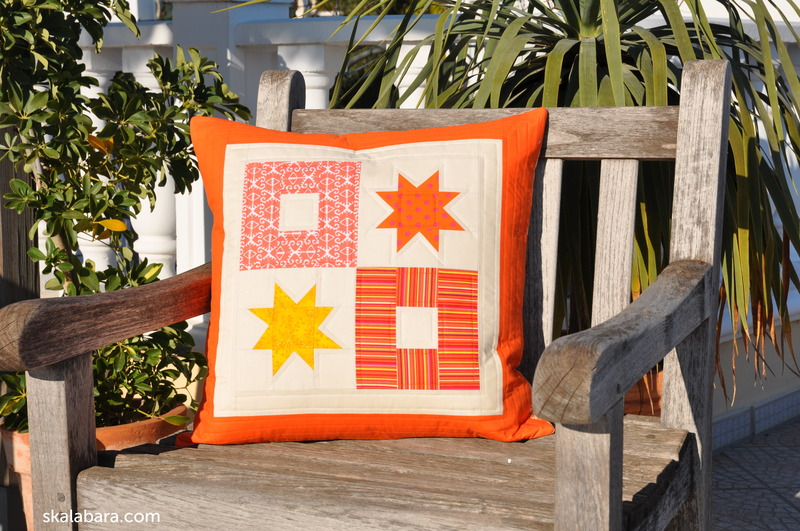 Happy sewing, I am over to have a look on Bloggers’ Quilt festival at Amy’s Creative Side. Next time hopefully with one of my quilts!